200 feet tall. Fast growing tree with upright branches and thick bark. Seeds provide an important food source for chickadees, finches, Douglas squirrel, and many other birds and mammals. Grows best in full sun to part shade on well-drained soil. "Pinus contorta 28289" by Walter Siegmund - Own work. Licensed under CC BY 2.5 via Wikimedia Commons. 200 feet tall. Fast growing tree with bluish-green foliage and drooping branches. It grows well in moist, well drained soils. 200 feet tall. Fast growing evergreen. 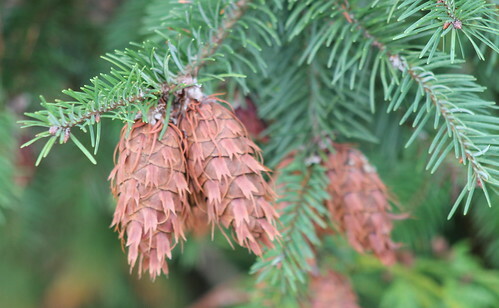 Short, thin needles are prickly to the touch and bluish-green in color. Grows best in full sun on moist, well-drained sites. 160 feet tall. Moderately fast growing evergreen tree that is shade tolerate. Found in fairly dry to wet sites. Graceful branches that droop with deep green needles. 40 to 95 feet tall. Bright yellow fall color. Fast growing shade tree that grows well in dry to moist sites. "Fraxinus latifolia JPG1Fe" by Jean-Pol GRANDMONT - Own work. Licensed under CC BY 3.0 via Wikimedia Commons. 40 to 80 feet tall. A deciduous tree that grows best in wet or saturated soils and prefers full sun to partial shade. Provides nesting sites and cover for birds, deer, elk and beavers. 75 feet tall. Dry to moist, well-drained, gravelly soils. Full sun to partial shade. Once established, stands of Oregon White Oak provide good habitat for many species of birds and mammals. 60 feet tall. Pacific Dogwood is best adapted for growing on sites with moist, well-drained soils, and areas that range from sunny to shady. From April until June, it produces large showy white flowers, which give rise to large red berries in late summer that are a favorite food for many species of animals. "Malusfusca" by Gordon Leppig & Andrea J. Pickart - http://www.fws.gov/humboldtbay/plantguide/genus-m.html. Licensed under Public Domain via Wikimedia Commons. 30 feet tall. 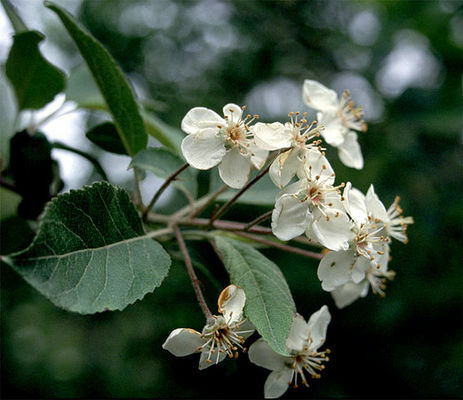 Clusters of white, fragrant blossoms appear in spring, followed by bunches of small edible apples. Prefers moist soils. 80 feet tall. Smooth white bark that peels in layers. Beautiful golden fall color. Grows well in wet areas but does not like shade. 30 to 120 feet tall. Fast growing, highly adaptable deciduous tree that is useful for stabilizing disturbed soils and revegetating nutrient-poor soils. Provides food and cover for birds, butterfly caterpillars and other wildlife. Full sun to partial shade.